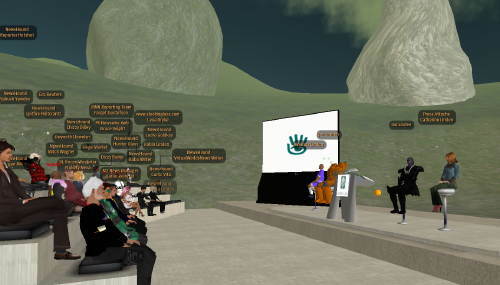 Linden Lab Press ‘Tech Talk’ Media Conference – Aussie Second Life servers still likely. Today at 3pm SL time (10am Saturday 26th January AEDT) Linden Lab held a media conference entitled ‘Tech Talk’ that featured Linden Lab’s VP of Platform and Technology Development Joe Miller, VP of Systems Engineering Ian Wilkes and Software Developer / Havok 4 ‘Guru’ Andrew Meadows. [15:12] Reporter Hotshot: Adult Video News media Network: As I’ve toured SL with an eye toward the adult use in the space, what I see is a broad swath of varied uses in sexual activities. Both private and commercial. In the past year, there has been a considerable amount of media attention regarding the adult product copyright violations of SL Powerhouses like Strokers Toys. So much so, that the top adult industry publication, AVN, has put me “in-world” as an “embedded reporter” for them. The three hundred pound gorilla in the room seems to be how very much Sl is being used by most citizens for sexual explorations, and how very little anyone at the company wants to talk about it. How do the Lindens feel about this, and do they support it? and the follow up question, why, or why not? [15:13] Lexa Dryke: Joe – not directly related to your immediate subject matter – can you tell us if there is a technical reason to limit the number of groups per avie (avatar) to 25? [15:18] Dizzy Banjo: Following the recent survey LL have taken out. What is the current strategy for the development of voice ( recording / voicefonts / voice to text etc ) ? Did the survey results provide anything you hadn’t expected ? [15:24] Katier Reitveld: I do motor racing as a side in SL and the physics engine currently causes a lot of issuies. Lag, cars going throught he track, sticking togethe rand freezing mid track when they collide.How much of an improvement with the upgrade to Havoc be liekly to improve this? [15:28] VirtualWorldsNews Writer: You mentioned a lot of projects that seem to be building on the experience for existing users–stability, performance, etc. That’s great, but what is being done on development side specifically aimed at new business, consumers, etc.? Joe Linden: Improving search has been one small step that helps both business and consumers. Additional search capabilities on the way. ‘Dazzle’, a re-skinning of viewer is also on the way. [15:37] Mitch Wagner: Joe, you said a few minutes ago that the Lindens are looking to make it easier for users to find context and people of like mind and like interest in Second Life. Could you please go into more detail on that? [15:39] Chizzy Dilley: Could you give me more long term plan, 1, 3 to 5 years, I mean some like road map if you have for viewer, server, and back system, or others. any concern or difficulty for developing with other language? Do you put any team member as international developer? [15:42] Eric Reuters: anecdotally, I’ve known a lot of people who have tried SL, if no reason other than they heard I was reporting here, and no one ever told me the reason they didn’t stick was the viewer crashing. on what do you base your belief that the reason newbies don’t stick around is the user crash rate? And not, say, the UI? [15:43] Tinsel Silvera: There are a lot of Residents with older hardware that does not work well with Windlight. Will Windlight be kept optional or will it be incorporated to a point that those Residents will be forced to upgrade their hardware? [15:46] Yabush Yamdev: Now we can’t input Japanese language directly into scripts. Can we use Japanese language and other two-byte characters in scripts in the near future? [15:47] spitfire Hultcrantz: What kind of content or event do you think suitable for Havok4 Second Life world? Or, what kind of change do you want users enjoy in Havok4 world? [15:51] Reporter Hotshot: I have a development related question….are you planning to make APIs available to developers to link “inworld” actions with external user computers….so one might deveope an interactive haptic interface that responds to inworld actions? [15:59] Curric Vita: I am Steve Atlas, writer for Metanomics.net. My question is: Which elements of the SL experience do you see as central improvement dimensions in retaining new and experienced users, and in that context, what actions are you taking to ensure that users do not migrate to competitors’ grids as viable alternatives emerge? My take on the whole thing? There’s no doubt Linden Lab from top to bottom are stating their commitment to improving stability and there’s fairly wide acceptance of the sincerity of that claim. Like anything, if progress isn’t perceived to have been made, the next media conference may be a different atmosphere to todays. On the issue of Australia-based servers, I have no doubt they’ll occur but after comments of ‘real soon now’ in May 2007 it doesn’t appear timeframes are any firmer. Update: the official transcript of the podcast released prior to the media conference is now available. Second Life metrics to the end of December are now available and from an Australian perspective there’s been a significant drop in active users – 10,644 is the number cited, down from 11,982 in November and a long way under the fifteen thousand of mid-2007. Australia maintains its position as 11th in terms of worldwide active users. Given there’s record concurrency (number of users online at the one time), why the sustained drop off in numbers? Linden Lab has a long standing mantra of being as transparent as possible although over the past year this has been tested in the customer service area, with a number of changes undertaken with little consultation or notice. A small step back in the other direction has occurred with the announcement that customer service metrics will be released each month. The metrics themselves are rudimentary but at least provide some ideas on service trends. It’d be nice to see statistics around abandon rates (how many people gave up waiting in queue on the phone) and number of support tickets were resolved rather than number of tickets submitted. Credit for another step in transparency but it’s far from full transparency at this stage. The November economic statistics are available and it shows an active Australian Second Life population of 11,982, a whole seven more the September figure of 11,975 (Linden Lab didn’t release anything for October until the update today). Once again Australia remains in 11th place world-wide, which is 2.21% of the overall vatar count. Given that this time last year the population explosion was well under way, it’s fair to say that things are stagnating a little from the Australian perspective. The Xmas / New Year break may lead to some more sign-ups or we may end up with more of the same. Have we reached saturation point in Australia? I wouldn’t have thought so but the argument that it’s seasonal is getting tenuous given the period of time it’s been going on. Update: New World Notes has an interesting discussion on the plateau phase Second Life has reached. Linden Lab have released their service metrics for November. There’s been some improvement but overall performance remains a mixed bag. Although there’s been an improvement over recent months, you can still expect a viewer crash one in five times – hardly a stable platform but at least one on the improve. 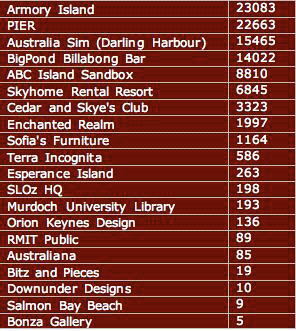 Whilst trawling around Linden Lab land metrics, it occurred to me that it’d be interesting to work out how much of Australia Second Life would take up. As of the end of September 2007, the Second Life grid equated to 871.32 square kilometres of land. Australia is 7 682 300 square km, so all of Second Life makes up just over 0.001 precent of Australia. Tasmania is 68300 square kilometres so even though Second Life seems vast, we’re more a small city (roughly two Wagga Waggas) than a world in geographic terms. 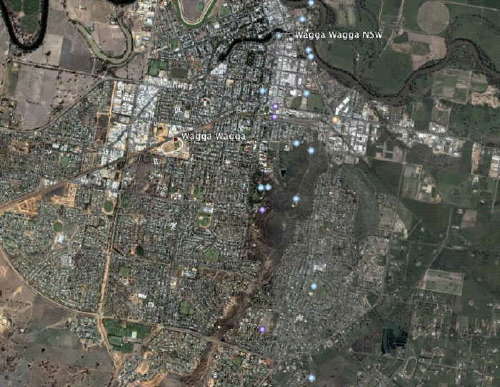 Funnily enough, Wagga has a population of nearly sixty thousand people – not much more than the number of people using Second Life in peak hours. Linden Lab have released the metrics for September 2007 and there’s been a further significant decline in the number of Australians actively using Second Life. The active Australian population is now cited as 11,975, down from the 13,567 reported last month and the 14.832 the month before that. Australia has stayed in 11th place overall for countries using Second Life. That’s a really significant drop in Australians using SL actively. We seem to be heading back to below ten thousand if the trend continues. Linden Lab have released the metrics for August 2007 and for the first time since we started monitoring Australians in Second Life, there’s been a decline. The active Australian population is cited as 13,567, down from the 14,832 reported last month. Australia has stayed in 11th place overall for countries using Second Life. According to New World Notes, Australia comes in fourth as far as active residents in proportion to country population. Has SL reached its saturation point in SL? I’d think not, although until there’s a new reason for Australians to hear about SL such as a new corporate presence or other major event, I can’t see any great increase in numbers occurring. Linden Lab have released the metrics for July 2007 and the rate of growth is slow but steady. The active Australian population is cited as 14,832, up from the 12,910 reported last month. Australia is back to 11th place overall. One of the interesting new metrics released was number of SL sessions that ended abnormally i.e. crashes. Since January 2007, around a quarter of sessions ended in a crash. That’s an astounding level – imagine any established software vendor trying to sell a product that only works correctly three out of four times. That said, it illustrates just how committed Linden Lab are to transaparency that they even publish figures showing their key weaknesses. We’re back with an expanded STI. The overall feedback has been positive, particularly once we’ve explained the general purpose of the STI. Our favourite quote in reaction to last month’s initial effort was that using traffic to measure popularity was like using turds to measure digestion (thanks Metaversed). 1. The number linked to each presence is a standard average based on dwell statistics provided to all SL users via the Search Places option. 2. For large presences we’ve chosen the most popular area rather than add up total dwell – this means larger presences may have overall larger numbers but that’s not what we’re measuring (see also point 5). Example: The Pond and ABC Island have many different areas – we track the traffic on the most popular area for both those presences. 3. Each presence, unless an addition since the start of the reporting period, has had their traffic stats measured at least ten times with each instance at least 24 hours apart. 5. The STI is indicative only – yes we know there are much more detailed methodologies and that ours is a rough guide only for the SL community – we think of it as a ‘what’s hot’ measure. Discussion / criticism on the STI here. There are a couple of additions to the index, with PIER one of the more popular new ones. The Enchanted Realm traffic is based on one sample only so it’s too early to tell if it’ll maintain its current position. The Billabong Bar and ABC Sandbox retain their appeal and Armory Island’s wall-to-wall gun-toting keeps it in prime position. If you have a presence in SL that you’d like added to the index, let us know. It just has to be owned / operated by Australians for inclusion. We look forward to any feedback.